Perfect Location! Newly Renovated , Spacious, and Clean! 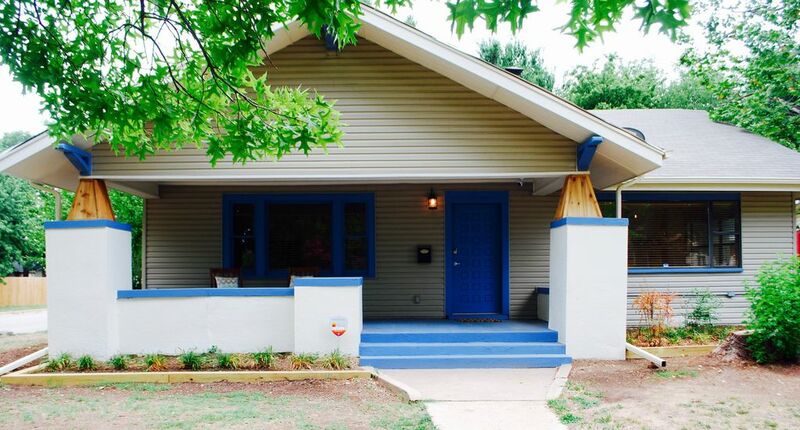 Completely renovated vintage charmer in walkable neighborhood!! Easy walk (1 block) to restaurants, shops, and bars on Western Ave. A quick 3-5 minute drive will get you to basically anywhere in central OKC – Midtown District, 16th St District, Penn Square Mall, and 23rd St Uptown District, and a 7 minute drive will get you to Downtown, Bricktown, Deep Deuce, Automobile Alley, and the Chesapeake Energy Arena. Our vacation rental has been completely updated with modern amenities while keeping its vintage charm. The home has 3 bedrooms and 2 bathrooms with a large living room and kitchen. The master suite has a king bed and private bathroom, second bedroom has a queen bed, and the third bedroom has a day bed with king bed or two twin bed option. An air mattress is also provided if you need to accommodate up to 8 guests. Baby gear provided upon request i.e. Pack-n-Play, high chair, stroller, and toys. Beautiful deck with furniture and huge fenced in back yard. Direct TV in living room, master, and queen bedroom and free wireless internet. AT&T Digital Life security system and keypad for entry, so no need to worry about remembering the keys. Owner provides paper goods, linens, coffee and tea for Keurig. This property consistently has 5 star reviews. I own and operate the home. I am very responsive, easy to work with and will always treat you as my guest. Come visit! Hi! I'm Noelle. I live in OKC and love all that this city has to offer our guests. Fun and unique dining, Thunder basketball, college football, conventions at the Cox Center with tons of family fun opportunities on the river, at the zoo, at the science museum, etc. I'm born and raised a Sooner but still stay true to my alma mater CU (Go Buffs!). I have eight years of experience in the hospitality industry working at hotels and condotels in Vail and Boulder, CO. I have worked for the past ten years in the non-profit sector. I have two amazing little boys and a wonderful, supportive husband. I enjoy tennis, the outdoors (miss those daily hikes! ), and spending time with my family and friends. I would love to host you! I fell in love with this home the minute I saw it. I love historic homes with the tall ceilings and tons of light. I love the Francoma inset on the fireplace. I love the idea of being able to walk to local restaurants and shops and walk to a park with splash pad, big toy, basketball and tennis courts. I love being able to uber anywhere in the city from this house for $5. I love the brand new kitchen and bathrooms and huge yard for kids and dogs. Location, location, location. Modern amenities with historical charm. Table in kitchen area seats 5-6 plus a kitchen island with 3 bar stools. High chair available upon request. Toys and games stored in middle bedroom closet. Table with 4 chairs and 2 Adirondack chairs with side table. Additional baby gear available upon request - i.e. pack-n-play, stroller, high chair, etc. For a fee housecleaning can be arranged during your stay. Beautiful home, nice yard, great location! Loved this house! You can uber to the Paseo district, which is cool. Walking distance to a few places on Western ave that are cool. Definitely uber to Bricktown. Our dogs loved the back yard. Love that the house was so well stocked with everything you need! a very nice location close to everything would most definitely book again!! The property was very nice, just as described and the owner was very helpful. I would stay there again. Great house in a delightful neighborhood. The three bedrooms and two baths were comfy, with plenty of space for our family of four. Kitchen has everything you need. Would definitely stay here again. Thanks Noelle! As another review says, the house looks exactly like the pictures. It is clean and well stocked. The beds are some of the most comfortable we have ever had in a vacation rental. I would recommend and plan to rent again when back in the area. Convenient location, nicely remodeled, attention to detail for everything you need! Stayed at Helm Farm to visit family for Christmas. Location was easy access to all family in OKC. House was very nice. Love how it has been remodeled. Nice attention to detail throughout the house. Kitchen is well stocked for cooking. Including coffee, spices for cooking, etc. Ice in freezer. Kleenex provided (loved that). Nice towels, bed linens, etc. I seriously can't think of anything I can think of that I wish they had provided. Also, Noelle was very helpful. Will definitely stay here again.